Every year in the garden seems to teach a lesson about how things change. This year, I’ve been disappointed in my blueberries. I wrote a post a few years ago about my blueberries and how I always manage to harvest lots of them despite giving them no protection from birds (and there are lots of birds around). Last year I lost a few more berries than usual, enough that I decided this spring to hang up some bird-scare tape, the shiny red-and-silver kind that’s supposed to make birds think your plants are on fire. Well, I guess my birds are daredevils, or attracted to flashy things, and certainly extra hungry, because they’ve been taking ALL the berries from the day the first ones got close to ripe – in fact since then I have not seen a single berry looking anything like blue. Blueberry harvest this year = absolutely zero. Down from weeks of decent harvest last year, plenty to eat fresh and freeze. So why the sudden change? 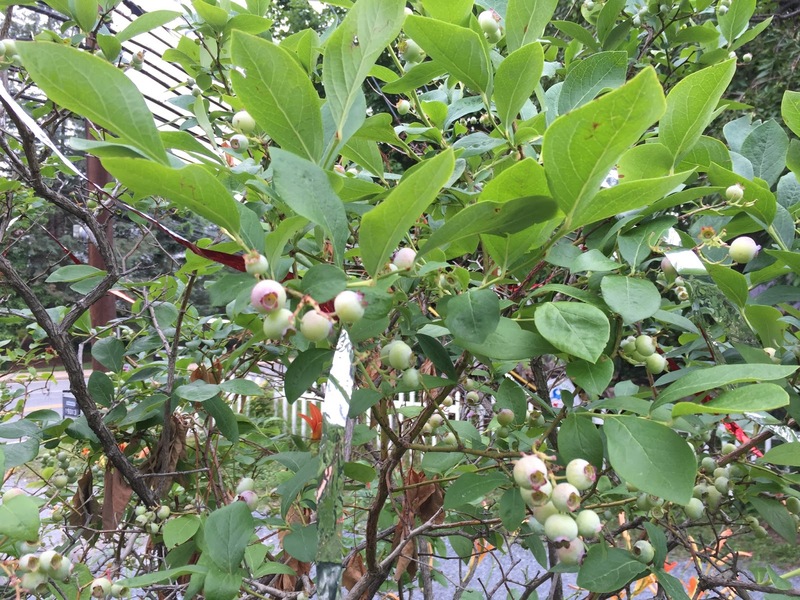 My neighbor, a Master Naturalist, says she’s seen a lot more jays, catbirds, and other large birds that enjoy and can handle the size of blueberries. We have many large trees in the neighborhood, and lots of food for birds, between insects, other berry and seed plants, and supplemental birdfeeders. Maybe the population is up and they have finally figured out – after 15 years or more! – that the blueberries are available. I will also confess that I haven’t pruned my blueberries properly in a while, and I plan to do that this coming late winter (and will remember to post about it then!). This should make the crop heavier next year – but will it be enough? A few flowers might have succumbed to the late freezes this spring, which decreased the fruit setting. However, I still should have been able to harvest some! It’s particularly infuriating to lose the harvest this year, because I’ve just planted six new blueberry plants in the space where we took out a useless privet hedge. However, the cleared space does allow me to put up some kind of structure around the new bed – something attractive, since it’s a prominent part of our landscaping – that can be covered with bird netting while the plants are bearing. I won’t be able to do that with the original four plants, unfortunately. I also plan to create a structure around my newly redesigned black raspberry planting, since I have not harvested any of those either this year – and again, we are used to sharing with the birds, but always get plenty for both fresh eating and preserving a bit. And who knows – maybe next year the birds will find something else to snack on, and the harvest will go back to normal. Anyone who’s been gardening for a while can tell you that each year is different – the year you get no tomatoes, or no squash, or no beans, and the years that those crops are super-abundant – and the patterns are not necessarily predictable. And luckily, the local farms have plenty of blueberries to pick – so my husband was still able to start his planned blueberry wine, and we’ve had snacks and cereal toppings and desserts. It’s just not June and July without blueberries! Once the birds get a taste of the berries, it is near impossible to keep them away. I had luck for a few years as well, but eventually resorted to a PVC frame with netting that was tied to the frame with cable ties. I would watch the birds would continually probe the frame and netting to find a weak point. Mother nature works 24/7/365 against us. Eventually they pecked through the netting. I thought maybe the first time or two that my netting may have been bad, but eventually realized they pecked/chewed through the netting. I have purchased a Tophat blueberry this year and put it in a pot. Hopefully I can move this to the front porch when they start to get to the ripening point. I have also let some bee balm grow up around one plant. Maybe that will disguise it, but I am not hopeful. Although my blueberries have been there for 15 years and the birds have “had a taste” every year – I always surprise some of them when I go out to pick – but never have they taken more than 20% or so, until now. I have sure had the getting-through-the-fence experience with the pesky groundhogs, though! My impression (I haven't really done a survey) is that we have a lot more birds in the yard this year. Or we did, earlier, still a lot of bird calls, but not seeing them all over the place hunting food for the hatchlings. It's gotten very dry, we are in a severe drought at this point in SE NH, that may be keeping them from a second brood here? I've also had many more birds this year than usual. Tons more babies than I usually do. My dad has said the same thing. As for covering the blueberry bushes, I tried not covering until the robins found the bushes. Then it was game over and I went ahead and put out my netting. I use a combination of trellis', shepherd's hooks and 2 arbors/arches from Aldi to make my support structure. Easy to adjust as the bushes grow and they don't look ugly. Good thing as my bushes are in the front yard. Here in MD we've probably had just the right weather combination to keep them breeding. I have 5 bushes and was able to store ~12lbs of blueberries in the freezer after using up the rest of the harvest. I have the berries surrounded by a tall garden fence and bird netting draped over the top, held up by a tall “T” post my husband made. The part I don't like is the bird netting that we have around the sides of the fence, it tends to rip easily and forms many weak spots that the catbirds learn quickly to exploit. I have started to replace the bird netting along the sides with a heavy duty plastic garden fence, this will not tear nearly as easily. I can't wait to finish this fence improvement after vacation, I love watching frustrated birds. Good idea to look for the fencing that works for you. Many bird nettings also tend to catch on themselves and animals get trapped in them (including snakes, not fun!). I agree Lucy and was just going to say the same thing! I think there is a bigger bird population this year. I definitely have noticed and heard more songbird activity where I am in rural Virginia.